Hiya Internet friends! Today I’m suuuper excited because I’m kicking off a new series! In honor of my one year blogiversary being this month, I’m starting a 5 part series about how to start a blog and my tips/tricks and advice! When I first started out blogging I had absolutely no idea what I was doing. I took to Google and Pinterest to help guide me on my merry little blogging way. I learned as I went and taught myself what I needed to know. The information that I’m sharing I've compiled from various different sources on the Internet. I've read millions (okay not really millions but a whole lot) of articles over blogging, branding, content, social media, networking and pretty much everything of that nature. By no means do I know everything about the blogging world. Most of the time I’m just winging it and hoping it’ll come out alright. There are tons of other bigger bloggers who probably know a heck of a lot more than me and can offer up better advice. But nonetheless, I’m going to share with you guys my own little guide to biting the bullet and starting up a blog! Before we get started here's a little outline of what I'll be covering in the series! Part 1, which is this one you’re reading, will be about the basics of blogging and laying the ground work for your blog. Part 2 will be defining your brand. Part 3 will be about content, photography, layout, design, text, etc. Part 4 is social media and promoting yourself. And Part 5 will be resources that are super helpful for ensuring your blogging success. 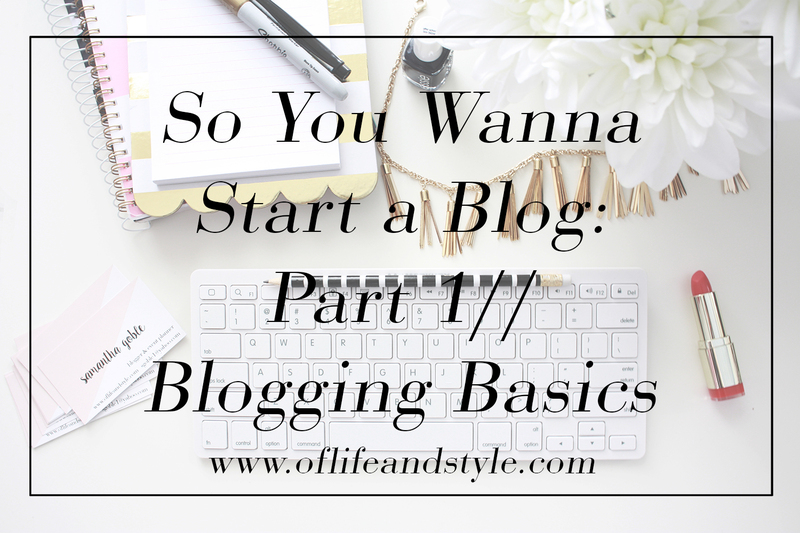 So without further adieu let’s get into the basics of blogging! You’re the realest and YAY YOU for deciding to start a blog! It’s no easy decision, but it’s a great one! First you need to decide what type of blog you want to start. Every blogger has a general theme that they follow for their content. Will it be fashion/style, beauty, food, travel, fitness, photography, home, DIY? Most bloggers, myself include, crossover into a few different themes. Having a theme will help you find your focus on what your content will be about. What are you passionate about it or an ‘expert’ on? If you’re having trouble figuring out one ask yourself this question, what blogs are you already following? What’s drawing you to their blog? More times than not your theme will revolve around those who you’re already reading. Helpful Hint! When choosing a theme keep in mind how much time you have to devote to it. Once you've figured out what you’ll be writing about it’s time to find you a platform. The two most popular and used are Blogger and Wordpress, although some do use Squarespace or Tumblr. I use Blogger and haven’t had any troubles so far. It’s free, easy to use, simple to navigate and design. Wordpress is more challenging for beginners, so I wouldn't recommend it. But it’s completely up to you. A quick Google or Pinterest search on the great debate can help you pick which is right for you. Now here comes the hardest part, or at least in my opinion; picking your name. This is the most vital part to your blog and the most important decision. Whatever name you choose you want it to create a good first impression. It can be a daunting task but that’s why I’m here! To help make it less scary and more fun and easy! Here’s an example list and pairings that I made when I was figuring out my second name. Helpful Hint! Also it’s okay if over time your blog’s name changes. Mine did. I started out as ‘she is little she is fierce’ and just recently changed to ‘of life and style’. I changed because it didn't really fit my style and brand. -Keep it easy to spell. Something like Cupcake Connoisseur probably isn't the best. I don’t even know how to spell connoisseur without spell check…. -Make it simple to remember. Don’t over think it. The Stripe is a perfect example. -Make it catchy/memorable. A great example is Carrie Bradshaw Lied. What did she lie about? This makes you want to go to the blog to find out. -Don’t make it too long. Life and Times of an Outfit Repeater is too long and most people won’t remember the whole thing. -Don’t make it too specific and try not to use a location in your name. What happens if you leave your current location or your blog shifts focus? -Make sure it’s available. This might be the most important. Don’t get business cards printed with a name on it and not have it available! In sum your name should be short, sweet and to the point. If you’re not sure of one ask your family and friends if they heard it what they’d first think of/know what it’s about. Domains go hand in hand with picking a name. Before you’re dead set on a name do a quick search and see if it’s even available. If it’s not then back to the drawing board. If it is and you know you’re going to be blogging for awhile then I say go ahead and get it. If you’re using Blogger you’ll have the .blogspot.com attached to whatever name you choose. Having a .com domain name will make everything so much cleaner and simpler. Which would you choose; www.oflifeandstyle.blogspot.com OR www.oflifeandstyle.com? Probably the second one right? Some popular site to get a domain name from is GoDaddy but there are tons out there. I have mine through GoDaddy and it was pretty straightforward to get. Once you've got your theme, platform, name and or domain it’s now time to get set up in the social media world. Create accounts on various social media platforms for your blog. The mandatory ones I’d recommend setting up are Facebook, Twitter, Instagram and Pinterest and an email. “But Saaaam, what if I’m not on one of those?” Get it anyways, just in case. Who knows maybe you’re not into Instagram now but maybe down the road you will be. They’re all free so what do you have to lose? Better safe than sorry! “So do I use my blog name or my real name?” That decision is completely up to you. If your blog name isn’t available I’d use your real name. I have the majority of mine with my real name, the exception is Tumblr. There’s no right or wrong answer to this one. Some extra social media platforms that can be used are Tumblr, Snapchat, Vine and Google +. 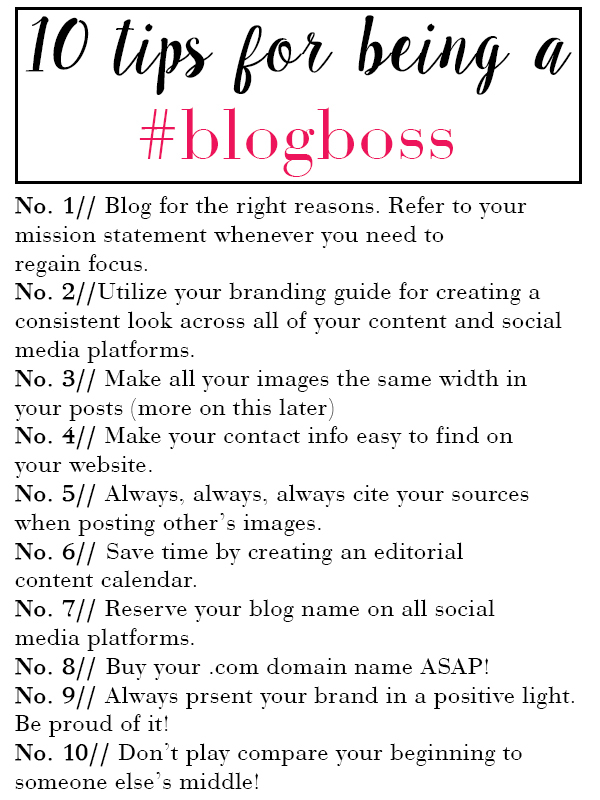 To leave you inspired and excited here are 10 tips on how to be a #blogboss by Lauren of La Petite Fashionista's Social Media With Style workshop! That’s everything for part one of the series! This was like the “prologue” and parts 2-5 will be the “chapters”. I hope that this information helped you on figuring out this whole blogging thing a little better. It can be a little, okay a lotta scary to start something that’s really putting yourself out there but I can almost promise you’ll be glad you did. Part two is defining your brand will be featured next Saturday, the 14th, so make sure to check back for that!